The film portrays the final days in the life of Boonmee (Thanapat Saisaymar), a middle-aged man with failing kidneys who recalls his various past lives from his deathbed. 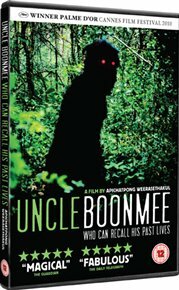 Along with a nurse Jaai (Samud Kugasang), his sister-in-law Jen (Jenjira Pongpas) and his young cousin Tong (Sakda Kaewbuadee), Boonmee has come to a remote forest cabin to end his days, as he believes it to be the place where his former existences took place. As he revisits his many reincarnations and is reunited with the ghosts of his dead wife and lost son, Boonmee becomes immersed in memories and undergoes intense personal transformation as he surrenders to the inevitability of death. The film won the Palme d'Or at the 2010 Cannes Film Festival. The film portrays the final days in the life of Boonmee (Thanapat Saisaymar), a middle-aged man with failing kidneys who recalls his various past lives from his deathbed. Along with a nurse Jaai (Samud Kugasang), his sister-in-law Jen (Jenjira Pongpas) and his young cousin Tong (Sakda Kaewbuadee), Boonmee has come to a remote forest cabin to end his days, as he believes it to be the place where his former existences took place. As he revisits his many reincarnations and is reunited with the ghosts of his dead wife and lost son, Boonmee becomes immersed in memories and undergoes intense personal transformation as he surrenders to the inevitability of death. The film won the Palme d'Or at the 2010 Cannes Film Festival.